Two new signings… in one day… and the first friendly just five days away. Who’s up for this? That was some Saturday. For every World Cup humdinger, there was a new City signing. At one point it looked as if from midday onwards we were going to be fed a new signing every two hours. 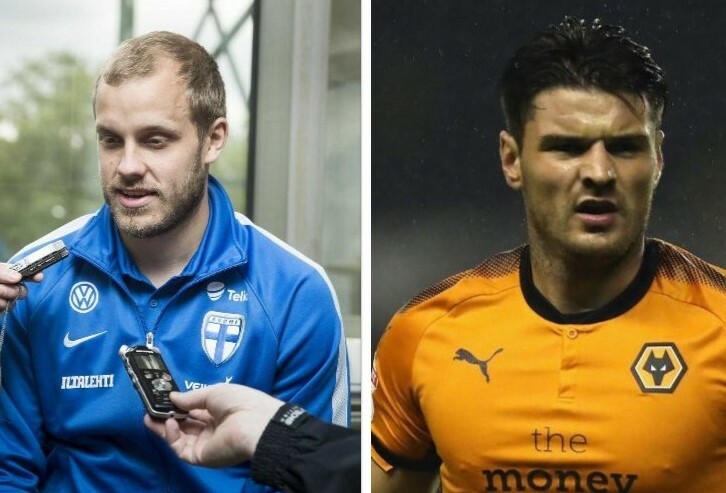 But it was just the two in the end: Teemu Pukki, who I’d never heard of, and Ben Marshall. who I had. In fairness, we pretty much knew that Marshall was one his way – Twitter was awash on Friday with City and Millwall fans going toe-to-toe on which direction he should be heading – but the 11:55 tease followed by the 12:00 announcement of Pukki caught everyone off guard. Even Nick Mashiter! Mashiter, if you’re not aware, is the press equivalent of that bloke at work who knows everything; the one who sidles up to you at the drinks machine and out of the corner of his mouth quietly delivers news on who’s about to be promoted and who’s about to get the P45. And he’s always right. That even he didn’t get a whisper on Pukki’s arrival speaks volumes for how the club went about their business on that one. So, Teemu Pukki… what do we know? Well, he’s Finnish, he’s 28, has a receding hairline (✔), has been around the block a few times, has a domestic goalscoring record of 1 in every 2.94 games and, until yesterday, played in Denmark for Brøndby. Along the way, he had a one-season stopover at Celtic – ironically as a replacement for the departed Gary Hooper – and it was with great delight that their fans took to social media yesterday to tell us that he was “pish”. It’s not a compliment. It was thoughtful of them but I think on this one we’ll make our own minds up. For starters, it’s a free transfer, so the financial outlay won’t be huge but more pertinent is his time at Brøndby where he garnered the reputation that caught the eye of City’s scouts. I’m no expert on Danish football but a goal in nearly every other game is decent and, perhaps even more relevant in the circumstances, is that he has built a reputation for his clever movement in and around the box – something that is an absolute must in the current set-up. Daniel Farke reiterated this point on the club’s site yesterday and spoke of a “technical player with really smart movements” and someone who has a happy knack of making “runs in-behind” – both big ticks in the box. That he’s “a brilliant character” – a trait that Stuart Webber and Farke value highly – is a bonus. So, as with every new signing, we wait and see. Some were quick to express their disappointment, and that’s fair enough if you’re happy to believe the gospel according to the Bhoys, but Pukki deserves his chance along with our unequivocal backing. Ben Marshall’s arrival was of a slightly different ilk. His name had been in the frame for the best part of a fortnight when it was first rumoured that City had joined Millwall in a two-way battle for his signature. Reports that he was happy to return to Millwall, where he successfully spent the second half of last season, were probably on the money but with up-front cash in the bank from the sales of Maddison and Murphy, it looks as if City’s greater financial muscle (relatively speaking of course) helped seal the deal. Precisely where Marshall fits into the side will only become clear once a ball has been kicked in anger, but with Wikipedia citing him as a winger/full-back (Wikipedia being about as reliable as the Bhoys’ gospel), it seems okay to assume he’ll be a perfect fit for the right wing-back role if/when Farke decides to go with a back-three. He’s also one who has been around a bit and, if you include loan spells, City is his tenth club. Along the way, he crossed paths with one Paul Lambert, who was so impressed with what he saw at Blackburn that, once he had taken up the reins at Wolves, he signed him again. And Lambert knows a player when he sees one. On the face of it, he appears a good fit (I thought the same of Marley Watkins mind you) and, like Pukki, deserves his shot at success in a canary yellow shirt. So, whisper it quietly, but the business done so far looks pretty good – well, on paper anyway. The signing of Mo Leitner was one I didn’t expect – certainly not on a permanent deal – and proves definitively that I don’t know what the hell I’m talking about. I mocked those who demanded we sign him as I could see no way of affording a player of his like within the current financial structure. But I was wrong – thankfully. He’s quality, one who always has loads of time on the ball, and to have him plonked in the centre of our midfield – either sitting deep or in a more advanced position – has filled part of the creative void left by Maddison. I’m not expecting too many more incomings but, working on the basis that Nelson’s bottom lip still appears to be doing its thing, maybe another striker in the squad wouldn’t be such a bad idea. We’ll find out soon enough – within the next 39 days in fact. A couple of welcome additions – one home grown, the other obviously not. Another striker, plus a right back, seems to be required at the moment, but I’m sure the headhunters / scouts are out, quietly plotting the next stage of the football revolution. On the RB I’m not sure Gary. As Gary G says, I’m sure Marshall will be used in the wing back role, and in pre-season I expect we will get to see Max Aarons tried out at RB too, where he plays for the U-23s (and was their skipper last year). If Ivo Pinto is reinvigorated there may be near enough cover there. The Oliveira situation is probably the main imponderable now. I wonder if Adam Idah will get given any opportunity there in pre-season? Both good signings. Pukki’s skills will bring new dimensions to the attack, including the pace we’ve been lacking since CJ left. Marshall brings creativity as well as solidity down the right side. IMO we aced Millwall by offering a four year contract. Looking forward to the season now! Pukki is a free hit just like Watkins was last season and I just hope he has a little more luck in front of goal than he did. Marshall is the strange one as all the papers, including those from Birmingham, stated that he was set on going to Millwall. Neil Harris must be spitting bricks to lose out on his main target. Oliveria – I suppose enough has been written on him and his behaviour last season. IMO the reason no offers are forthcoming is due to that and possibly any potential clubs will hope City will cut their losses near the window closing. Franke has left the club and the German side knows what they are getting from last season. I am confused by the loan and the option of a permanent deal. City will lose a little on this transfer so why not get it done now. We paid, according to some reports, £1.5m rising to £2.5m – well I can’t see the add-ons being met, so why hang on to him? With Maddison and Murphy sold to a Premiership clubs, we are safe that these will next season not come back and haunt us. Watkins is a hard one to assess. He scored at Inverness and Barnsley to make him a wanted man and City signed him on a free so had nothing to lose and all to gain. Was it the system we played, loss of form or a combination of both? Then there was the deadline enquiry from Bristol – he wanted the move and did an Oliveria for a few weeks. He has gone and City have got a good fee and add-ons. I will wish him the best, except against us. I put out a question on Angus Gunn to see if City had got a sell on clause. I did read we could earn money from a sale in the D Mail to a maximum of £3.5m, including the original fee paid. Let’s hope he gets a large transfer this window – all donations welcome. No news on an incoming goalie. We have lost one, out of contract.Mathews IMO needs a chance he could be capable and prove a good No1. McGovern is a possible back up but no offers so far – maybe the package he is on at City is scaring clubs off. So we need 1, possibly 2, goalkeepers – if we get a loan in then that will be Mathews as back-up, not good for his development. Lastly, we are all, I presume, waiting with batted breath on what the club will do with the 4 overpaid misfits Naismith, Jarvis, Martin and Wildshut. Jarvis – will he ever be fit to complete a game again at this level, never mind a complete season. Wildshut – rumours Wigan want him back on loan. Take the offer. Martin – past his sell-by date. Good memories at City and very poor at Rangers. My suggestion is go cap in hand to Peterborough and offer both Wildshut and Martin plus £3m for Marriott – we just might get a positive result or am I just being wildly optimistic? Not long now before the season starts counting down the days. Is he important to Hearts’ ambitions? Naismith made 14 appearances for the Jam Tarts last season, scoring four goals and creating three assists. Those aren’t bad numbers and back up what was effective attacking play for the majority of his spell at Tynecastle. Ordinarily rated at £1.35m by Transfermarkt, if he can agree a severance deal with Norwich, then that would allow Hearts to sign him on a free transfer permanently, which would be fantastic business. He’s a proven winner who has the kind of experience that will really help Hearts push towards the top end of the Scottish Premiership table next term. However, there is an argument to say that waiting on him all summer with little progress could backfire on Craig Levein, potentially missing out on targets who could have also improved the first team. Do you think Hearts should wait on Steven Naismith this summer? I’d love him to go. However, there’s a gulf between what Hearts can pay and what he’s earning at Norwich. Unless he’s willing to give up £1-2m (and why should he? ), we’ll have to shell out a large amount for the last year of his contract. Frustrating, but not much we can do. A case of minimising our losses, I’m sure. Good to see business being done relatively early. No sign yet of any inward loans – I think they can still happen after the PL window closes, so maybe this year we will have to wait until the top clubs have settled their squads before they will release the likes of Reed and Gunn (not those two, obviously but this year’s equivalent). Whilst it is a period of austerity at NCFC I would hazard a guess that sufficient funds have been accrued to allow Naismith, Martin and Jarvis to be paid suitable contract termination payments. In my opinion this could be paid for by the astonishing over the odds amount that Cardiff paid for Murphy. There might still be a deal out there somewhere for Wildschutt but certainly not the other three, the club needs to move on from this saga. Another saga to be resolved is Nelson Oliviera, no way back with the fans and I suspect Herr Farke has never forgotten day one of last season. Let’s get rid as soon as possible. Once this work has been completed then the club can truly turn the corner.